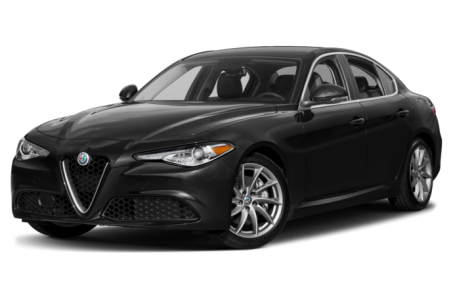 The 2018 Alfa Romeo Giulia is a midsize, luxury sport sedan that competes with the BMW 3-Series, Mercedes-Benz C-Class, and Audi A5. Three trims are available: the base model, Ti, and Quadrifoglio. The Giulia is powered by a standard 280-hp, turbocharged 2.0-liter 4-cylinder engine with automatic start-stop technology mated to an 8-speed automatic transmission. Rear-wheel drive comes standard, while all-wheel drive is optional. The Quadrifoglio is driven by a more powerful 505-hp, twin-turbocharged V-6 that produces 443 pounds-feet of torque paired with the 8-speed automatic and rear-wheel drive only.